Used Honda Civic Review - 2012-2017 | What Car? 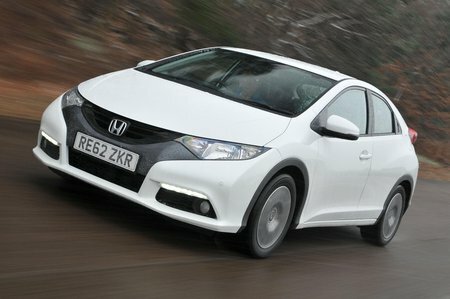 What's the used Honda Civic hatchback like? 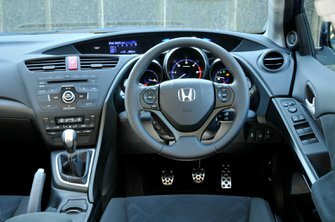 The British-built ninth-generation Honda Civic arrived in 2012, a continuation of the popular family hatchback whose durability and dependability had already won it plenty of fans. With its latest rival for the Ford Focus, Volkswagen Golf, Vauxhall Astra et al, Honda’s intention was to carry over the advantages of the previous generation, such as the spacious interior and excellent reliability, while making the Civic more enjoyable to drive. On the space front, the Mk9 certainly appeals, with a boot that is comfortably bigger than you’ll find in rivals. The Tourer estate model that arrived in 2014 was so vast that is offered more load space than some cars in the class above. However, head room in the rear of the hatchback is stingy, so it’s not a car for carrying four tall adults. But legroom is good and Honda’s ‘Magic Seats’ can either fold completely flat or flip up at the base to create additional space for carrying tall items. Storage up front is merely average, not that you’ll notice because your entire focus will be on trying to decipher the complicated dashboard design. The mass of buttons is complicated to work out, while the unusual layered dials are obscured for some drivers unless the steering wheel is set in its lowest position. Speaking of obscured, the split rear windscreen creates a large blind spot which means you can lose whole cars in your rear vision. For the same reason, parking is also more difficult than in the Civic’s rivals, so it’s worth noting that all but entry-level trim feature a reversing camera. The engine range from launch consisted of 1.4- and 1.8-litre petrols and a 2.2-litre diesel, with a CVT automatic gearbox available only with the larger petrol engine. A 1.6-litre diesel followed later, offering improved fuel economy and sub-100g/km CO2 emissions. While ride comfort is much improved over the older car, it’s still no match for the VW Golf, and there’s rather a lot of engine and road noise at motorway speeds, particularly if you opt for a petrol model. It’s also worth noting that the 1.4-litre petrol delivers only adequate performance, so isn’t great for overtaking slower traffic. On a twisty road, the Civic offers lots of grip and turns in well enough, but its steering is too remote to be able to call it truly fun. If that’s the kind of experience you’re after, then have a look instead at the extreme Type-R model, which was launched in 2015 and is a very different kind of car to a standard Civic. A mid-life facelift in September 2014 resulted in a few styling tweaks and improved specifications across the range, including the introduction of a new Honda Connect touchscreen system and autonomous emergency braking as standard.